[Update] We previously reported that Steve Blum had made a tweet about voicing a Final Fantasy character, and speculated, along with many others, as to what such a thing could mean. His having played Vincent in a previous Final Fantasy gave fuel to the speculative fire of the internet. It turns out, however, that Mr. Blum never made such a post. The “screen grab” was actually an image editing job done by a GameFAQs forum member. This is not to say the game has no chance of coming stateside, but it should be noted that this particular voice actor did not, in fact, make the post we claimed he did. We apologize for any disruptions of your calendars and Twitter feeds. [Original Story] Final Fantasy Agito XIII… I mean Type-0 will be releasing on the PSP in Japan this October, but any plans to localize the title for Western audiences have been kept quiet, until now. Voice Actor Steve Blum, who is best known for his work as Vincent Valentine in Dirge of Cerberus: Final Fantasy VII, among other games, has let it slip via twitter that he is doing voice work on a new Final Fantasy. What links this to Type-0, is that the character he will be playing is named King, and there just so happens to be a dual-wielding character named King in Final Fantasy Type-0. Shortly after the tweet was made, it was removed, but not before the power of the internet could take a screen grab. 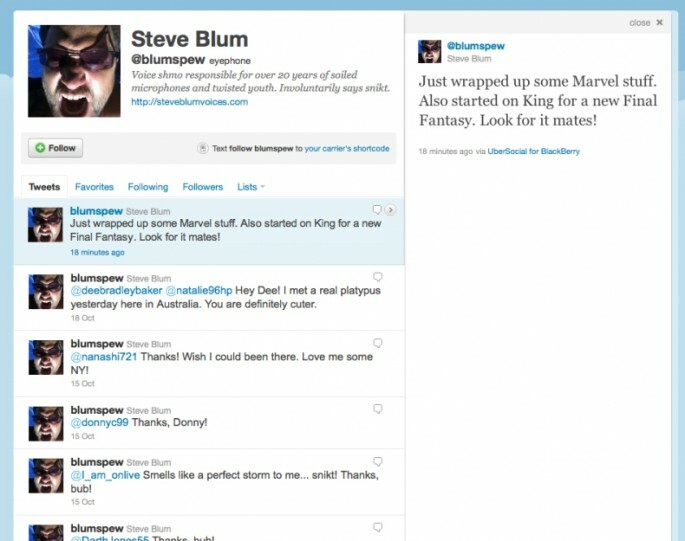 The tweet can be seen below, in which Steve confirms working on a character named King in a new Final Fantasy. This could be nothing or it could be the start of the localization process of Final Fantasy Type-0 in North America, a prospect that should be enticing for the 10 PSP owners here in the states. For now, file this under rumor until we get word from Square Enix, but until then, what do you think the chances are this is true?